BBC NEWS | UK | UK Politics | Is e-democracy now a reality? The Downing Street website crashes under the weight of e-mails from angry voters. Former Cabinet ministers Alan Milburn and Charles Clarke - not men previously associated with the cutting edge of technology - make a big splash at Westminster with the launch of a website. A British-made film praising American foreign policy becomes a hit on You Tube. There have been more than a few false dawns since e-evangelists first predicted the internet would revolutionalise British politics. But in the past few weeks a watershed moment may have been reached. The net finally appears to be moving into the mainstream of British political life. The question now is where does it go from here? And is it a good or bad thing for democracy? The road pricing petition, which saw 1.8 million people e-mailing the Downing Street website, was arguably the biggest protest against government policy since 2003's anti-war march. But the jury is out on what it actually achieved and whether such petitions can truly be said to be democratic, given that many people still do not have access to a computer. The government is pushing ahead with road pricing pilot schemes, giving ammunition to those who say it was just the latest in a long line of cosmetic consultation exercises. If nothing else, its supporters say, it made Tony Blair aware of the strength of feeling on the issue among a section of the electorate. But although the government was portrayed as having been given a bloody nose by the protesters, it is ministers who may have the last laugh. The e-mail addresses harvested by the petition are likely to prove a valuable resource for the government - even if Downing Street is only permitted to send one further e-mail to protesters, under data protection rules. A judiciously timed message announcing a change of policy could work wonders on sceptical voters. The main political parties have all ramped up their spending on internet campaigning in recent months. The Conservatives, in particular, have spent heavily on their web presence, hiring ex-Google staffer Sam Roake to come up with innovations such as Webcameron, David Cameron's video blog. The Labour deputy leadership contest has also seen a flurry of web activity, with each of the six contenders using websites and blogs to build a support base. But the only contender to emerge from the backbenches, John Cruddas, is suspicious of the internet as a political tool. Rather than breathing much-needed new life into local party structures, he is concerned Labour will use the net to create a "virtual party," divorced from messy real-life diversions such as meetings and face-to-face debate. On Wednesday, Charles Clarke and Alan Milburn made history by launching what some cynics were describing as the first virtual party leadership bid. The pair, long tipped as potential challengers to Gordon Brown, unveiled a website, The 2020 vision, which aims to provoke debate on future Labour policy. But why launch a website, critics asked at the launch. If they really wanted to provoke debate, why not simply launch a leadership bid? Veteran Labour MP Austin Mitchell - one of the first MPs to write a blog - derided political websites as the new "opium of the masses". Clarke and Milburn are not ruling out leadership bids in the future and the site could be useful way of building support, but they both insisted their real intention was to open up the debate on important issues such as the environment and social mobility. Mr Clarke said he wanted it to be a wide-ranging "big tent" debate, rather than a narrowly focused attempt to construct an alternative manifesto, but, he added, he hoped it would not be too "woolly" and inconclusive. 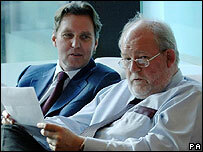 Mr Milburn said he wanted the site to throw open the debate about Labour's future to the public at large. They both pointed to the influence in US politics of web-based debates. They said current debates - such as Mr Blair's Number 10 based policy review and the deputy leadership race - were too inward looking and did not address the wider country. Mr Milburn's argument was that people were far more engaged in politics than they were in the past. They are no longer content to wait around for a general election every four or five years to have their say. You only have to look at the growth in popularity of political blogs and discussion forums, many of them highly critical of the government, to see his point. And it is a view gaining ground in government, which has made tentative efforts to open up the policy making process to the public through the internet. Web chats with ministers or officials formulating policy are still few and far between and those that have taken place have not attracted many hits, although this may be down to lack of publicity, according to a recent Hansard Society report. But, their Digital Dialogues report adds, government departments are keen to continue with the experiment, seeing it as a way of broadening out the consultation process beyond professional lobbyists and the usual special interest groups. Perhaps the most significant development in recent months has been the growth of video sharing. Politicians are starting to wake up to the potential of site such as You Tube as a way of bypassing traditional media outlets, with their strict rules on impartiality and balance. But others are also getting in on the act. Political web TV channel 18 Doughty Street has caused a bit of a stir with its latest video "A world without America," which has attracted about 250,000 hits, with the vast bulk coming from You Tube viewers. Tim Montgomerie, one of the people behind 18 Doughty Street and the influential Conservative Home website, says it is the opening salvo in a campaign to combat what he sees as the growing tide of anti-American sentiment. "It is much easier for British people to defend America, than for Americans to defend America. This isn't being funded by American business, it is not being funded by American TV networks," he tells the BBC News website. 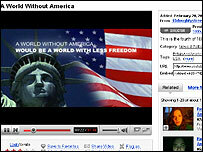 The ad, which takes is a satirical look at what life might be like if America had remained in political isolation, with spoof news bulletins announcing "Margaret Thatcher arriving at the world hunger summit in her state Lada" and so on, has generated fierce, if incoherent, debate on You Tube's message board. It was paid for by Stephan Shakespeare, a former adviser to Lord Archer, who was one of the founders of online polling company YouGov. In the past, Mr Shakespeare might have put his money into a think tank in order to influence the political agenda, says Mr Montgomerie, but the internet is now the only game in town. Doughty Street is quite open about its desire to bring US-style "attack" ads to the UK, via the internet. It recently produced a scathing clip about London mayor Ken Livingstone. But Mr Montgomerie insists it will generally steer clear of direct, personal attacks on individuals, of the type that have become so familiar during US elections, in favour of campaigns on political issues. Future campaigns include an attack on the ethics of the arms trade and the way the BBC is funded, apparently. Despite its close links to the Conservative Party - Mr Montgomerie was Iain Duncan Smith's chief of staff and was sent by the party to study web politics in the US - he insists 18 Doughty Street is home to a wide spectrum of views and its choice of campaigns is driven by its viewers. As for the rise of e-democracy, he believes it has hardly started. Mr Montgomerie said: "It is moving into the mainstream but I don't think we have seen anything yet, as to what it is going to be like. "We haven't had one really take off within Britain, such as a personal, strong attack on Gordon Brown or David Cameron. We are not intending to go down that route." But others, he argues, just might, raising the prospect of the Electoral Commission or the government attempting to legislate political advertising on the web. A quick glance at You Tube shows that UKIPhome have their own 17 Doughty St films attacking David Cameron. While the Tory leader's Webcameron films were also the subject of a much ridiculed spoof by Labour MP Sion Simon. And of course the George Galloway backed Ugly Rumours band - featuring a Tony Blair lookalike - look set to see their net-based single War enter the charts at the weekend. But even if the authorities tried to clamp down on web-based negative campaigns, sites such as 18 Doughty Street could simply move abroad, says Mr Montgomerie. The genie, in other words, is out of the bottle. The following comments reflect a balance of the views received. Whilst e-democracy seems attractive, the anti pay as you go road tax petition demonstrates a fundamental flaw. Voters are lazy. It is almost impossible to get balanced discussions on web forums so voters tend to be swayed by peer based comments. The media is expert at this but at least there is some form of restraint and comeback. This is not so with the internet and public forums. I am aware of individuals encouraged into signing the anti-pay as you go petition who upon reflection now regret attaching their signature. E-democracy makes it too easy to respond and encourages poor decision making/voting. Please stop peddling the nonsense that the road pricing petition was signed by 1.8 million people. It was signed by 1.8 million email addresses. 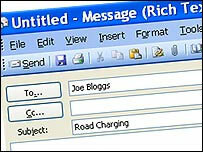 Most people have more that one email address and some ISPs give you an unlimited number. I was able to sign one of the joke petitions on the 10 Downing Street web site multiple times under false names. The problem with e-democracy is that it can easily be faked - 1.8m e-mail addresses, for example, represents nothing like 1.8m signatures. I currently have active 4 email addresses for various purposes, and could set up several additional ones for free in minutes from Hotmail or Gmail - it would look like several people despite only being me. The internet is awash with lies, deceit and conspiracy so seems like a fairly logical step for the politicians to get involved - what took them so long! In response to the other views displayed so far that it is easy to fake an e-petition, it's also easy to fake a written petition. You would be amazed how many Tony Blair from Downing Street had signed the last petition I saw! The BBC continues to peddle a strong line that web politics, 'blogs', internet ranting make any difference to the real world. In fact, this suggestion is always dismissed by real politicians and businessmen. Maybe this is linked to the decision to report less and less hard news in favour of the consensus opinions and speculation of more and more 'geeks', at the license payers expense, is related? What is always forgotten about is that most people in the UK are at best distrustful of the internet, if they even know about it. Only a certain slice of the demographic ever spend time spouting their opinion on the internet, and e-petitions are very open to 'viral' abuse. David J, David L and J Smith all sound like they work for the government. Desperately running off potential excuses to push ahead with this road pricing scheme despite its obvious unpopularity. This is the true flaw in e-democracy as well as the normal kind; unless it is near election time politicians do not give a damn what we say. Just as cheaper printing in the 18th century spread the ideas of the Enlightenment, so blogging is breaking down the cosy relationship between conventional media and the political classes. It is born out of the abuse of this relationship that this government has done so much to discredit. Whilst some anoraks may have signed the petition more than once, the vast majority of British people have more integrity than that. I have over a dozen email addresses put I chose to sign the petition just once. The internet has been used by political activists for some time now and this is nothing new. It provides a refreshing platform for free speech and unlimited possibilities in networking with other like-minded people - a marvellous antidote to a reactionary mainstream media that sides with the powerful and scapegoats the powerless. The powers-that-be would love nothing more than to curb our use of the 'world wide web' and indeed we have already seen clamp-downs occurring. But we justice-seeking net-surfers remain ever-vigilant to this! Ah, but the fact that David actually bothered to vote at all goes to show the strength of feeling. If it was all such a joke then why bother to vote even once, let alone multiple times? I love the way that people are talking about the pointlessness of e-forums on one. Surely that's ironic? While it is true that an individual could sign an e-petition several times, the fact that there is a balancing "pro road pricing" petition with a tiny fraction of the support the "anti" petition recieved still shows the strength of feeling. When all three parties are in favour of a flawed concept, how else does the public make it's wishes known? You can't vote against this in the next election can you? Looking over your shoulder dead tree media...? I'm off to a bonfire with Guido and the co-conspirators. It is incorrect to say that only a small number of people can use the internet. Free internet access in libraries and cheap internet cafes, where you get access for as little as £1 an hour, have made it available to anyone interested enough to try it out - and just like politics, there will always be a disinterested majority, but that's life. Just imagine how many people would have signed an anti-war petition in early 2003, if approximately 1.8 million people physically made their way to London and marched about the issue. Upwards of 30 million? Yet do we really think such a petition would have changed anything? With so much evidence of "garbage out" in instances of managed political e-participation, why should people feel compelled to provide anything more than "garbage in"? I visited the 2020 Vision site and saw a number of comments in their "Have Your Say" section, prominently from major Labour politicians, welcoming "this debate". I couldn't find the link on the site to the debate itself. Although Chandra is fairly correct, once you leave the big cities the availability of internet access in places like libraries and cafes all but disappear. What with libraries being shut due to a decrease in demand, cost etc... and lots of places stereotyping that everyone has a computer with the internet, these locations are often difficult to get to. Where I live, only recently an internet "cafe" has closed, with another one seemingly hidden on a back street, and with a library that most people probably don't even know exists which has only 1 computer available within it even if they do, sometimes even if you want to get involved you often cannot. But as you say, 'that's life'. Just because people watch videos on YouTube and other websites (that may or may not have a political agenda) does not mean that they are influenced by them of even agree with them. Add your comments on this story using the form below. What's the cost of e-mailing 1.8m people?